The final piece of Battlefield 4 DLC has been revealed. It's called Final Stand, a trip to the blustery north of Russia packed with futuristic weaponry including a powerful rail gun and a prototype hovertank. 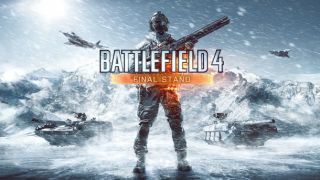 Final Stand will offer "intense, infantry-focused combat" across four new maps: Operation Whiteout, Hammerhead, Giants of Karelia and Hangar 21. EA says it wanted to "evolve the Battlefield experience" with this last DLC release, and thus it will feature "technology that will define the battlefield of tomorrow." That includes the aforementioned rail gun and hovertank, plus a few more surprises that will be revealed over the coming weeks. There's obviously a dearth of detail in the reveal video but it looks to me like snow, snow, slightly less snow, and Area 51—about what you'd expect from a videogame set in the wintry wastes of the Russian Arctic. No release date has been announced but Battlefield 4 Premium subscribers on the PC can get an up-close look at what's coming on the Battlefield 4 Community Test Environment , which began rotating the maps today. Access is limited but EA said it has "opened up the number of slots available" to help ensure that everyone gets a shot.